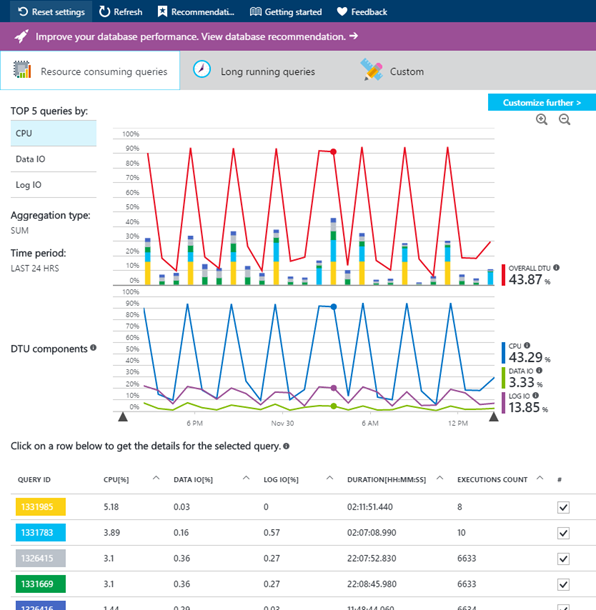 We are happy to announce that Query Store is turned ON in all Azure SQL databases (including Elastic Pools) which will bring benefits both to the end users and the entire Azure SQL Database platform. Query Store acts as a “flight data recorder” for the database, continuously collecting critical information about the queries. It dramatically reduces resolution time in case of performance incidents, as pre-collected, relevant data is available when you need it, without delays. We strongly recommend keeping Query Store ON. Thanks to an optimal default configuration and automatic retention policy, Query Store operates continuously using an insignificant part of the database space with a negligible performance overhead, typically in the range of 1-2%. The default configuration is automatically applied by Azure SQL Database. If you want to switch to a customized Query Store configuration, use ALTER DATABASE with Query Store options. Also check out Best Practices with the Query Store to learn how to choose optimal parameter values.